Welcome to the Wonderful World of the Suchitrans! It gives us immense pleasure to share with you the excitement of last few days, during which our learning took a new leap. We would sincerely like to thank parents for taking out time from their busy schedule and visiting the school. The importance of Ramzan month and celebration of Eid was beautifully explained by parents. Children got the opportunity to see the holy Quran, the prayer mat, the head scarf worn by girls and the cap worn by boys while offering prayers. Parents demonstrated how Muslims offer prayers in simple language. During lunch hour children also enjoyed sheer- khurma got by the parents. As parents, we do our best to support our children’s education. Many of us wish we could do more than our hectic lives allow. And when we do want to participate more, sometimes it can be tough just to know where to start. That’s not really anybody’s fault. In many ways it’s just the reality of the complexity of life. So somewhere, we at Suchitra, try to bridge that gap. Friday 25th July, was the day when our Sr. KG presented a Food Court to parents who participated in full strength and appreciated the hard work put in by the students and teachers. Hat’s off to the Sr. KG students, for the warmth with which they presented food to their parents. AND Thank you parents, you have been true partners in learning. Theme-end presentation was a grand ending of the themes ‘I am Special’ and ‘Farm to the Table / Transport’. It was a treat to the eyes to watch the little ones perform. The song, the skit, the dance, were truly mesmerizing, not forgetting the narrators who did an awesome job of reflecting on the journey of learning. The week began enthusiastically since Monday was the commencement of the English Language Week. 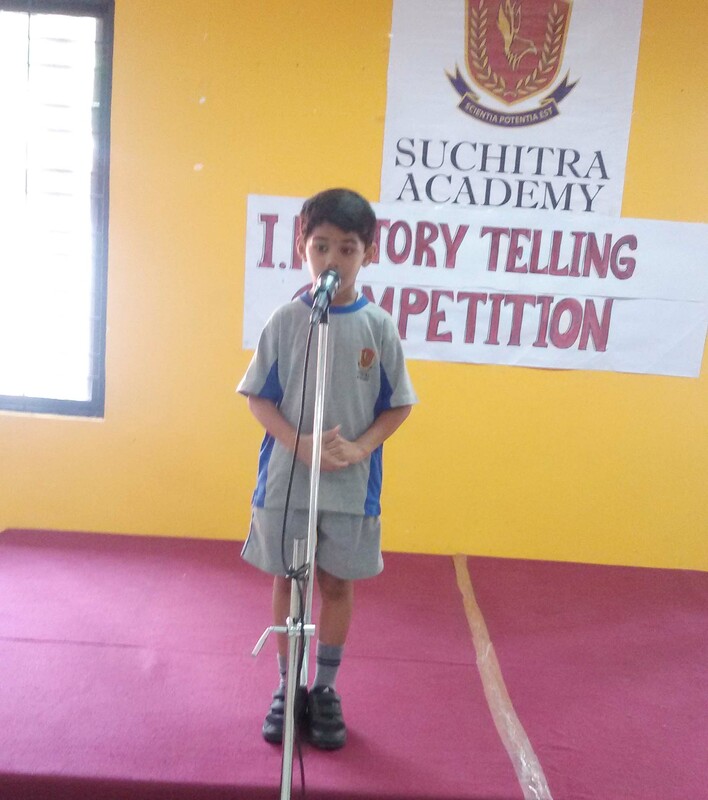 A plethora of competitions had been planned which would showcase the talent of the children. As you must be aware, most of the competitions were Inter-House and each and every child had participated in the initial elimination rounds. Ms Madhu Sharma, a renowned educationist, not only judged the competition but also explained the nuances of poetry and its recitation. She motivated the children to keep this poetic spirit burning and explore the pathways of literature. Mrs. T Kasturi Reddy, principal St Michaels School, was the judge for the afternoon and she greatly appreciated the talent among the children. A special assembly on RAMZAN was conducted on Monday, 27th July by Grade 10. The children enacted a skit in which the grand parents explain the significance of the festival to the youngsters. The children enacted very well and very much suited their parts dressed in traditional attire. A ppt was also shown highlighting the significance of fasting and doing good deeds. It was a very educative assembly for one and all. The students started with their FA-2 from Wednesday, 30th July. Dear parents, we hope that you take out some time to guide the children in their preparations as within no time these would be over. INTER HOUSE KHO-KHO matches were held on Thursday, 31st July. They were conducted in two groups Group I (Grades IV-VI) Boys and Girls and Group II (Grades VII-X) Boys and Girls. All the students played with full enthusiasm and wanted their house to win. The matches had their serious and lighter moments but at the end of the day the best teams won and all glowed with the pleasure of a game well played.